Brighton Ford : 50th Anniversary Mustang For Sale at Brighton Ford! 50th Anniversary Mustang For Sale at Brighton Ford! BRIGHTON, Mich - Calling all Mustang fanatics! We have an EXCLUSIVE offer that you definitely do not want to miss out on. There is ONE, we repeat ONE, 50th Anniversary Mustang For Sale at Brighton Ford! Out of the thousands of Ford dealers throughout the country, we were actually able to get our hands on a 50th Anniversary Mustang just for you! This Mustang is for sale on a first come, first serve basis. 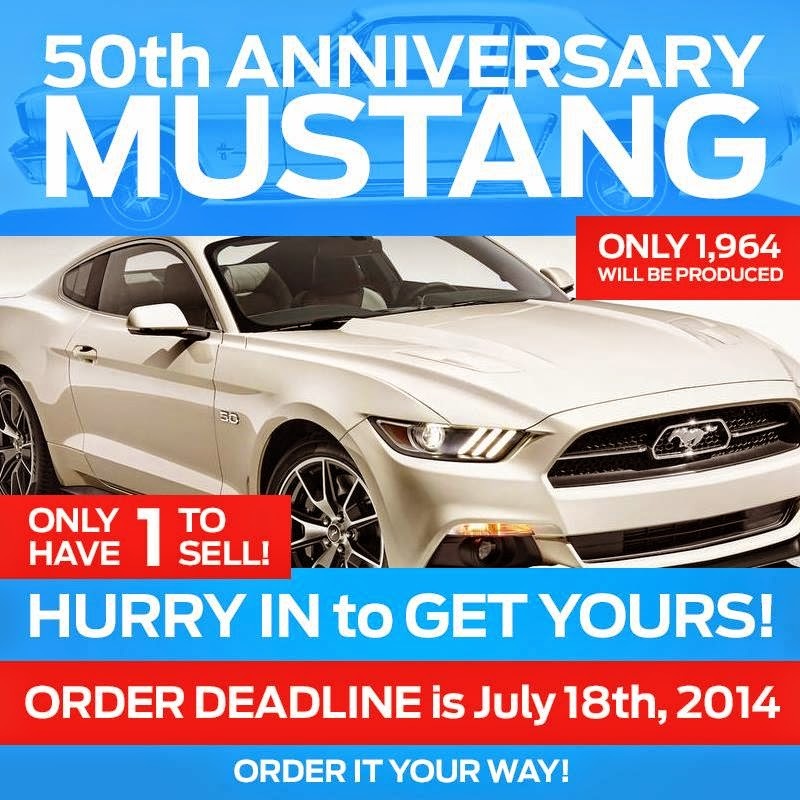 You will be able to order your 50th Anniversary Mustang in whichever color, Wimbledon White or Kona Blue, and transmission, automatic or manual, that you would like. You could be one of only 1,964 others to own a limited edition 50th Anniversary Ford Mustang by hurrying into Brighton Ford today! Act fast, the order deadline is Friday, July 18th, 2014! Brighton Ford is located at 8240 Grand River Ave. just north of I-96 in Brighton. We are a family owned and operated business that strives for customer satisfaction. For more information on Brighton Ford visit BrightonFord.com or give us a call at (800) 836-8206.